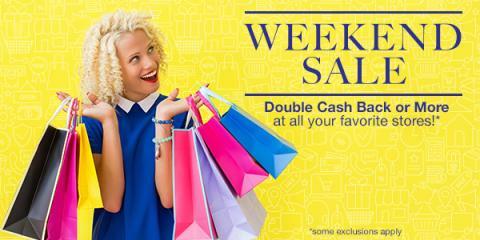 Home US , women Double Cash Back All Weekend Long! Just click this link to sign up for Swagbucks and shop at over a thousand different stores - you'll get points (called SB) for every dollar you spend. You can then turn those points into free gift cards at some of your favorite retailers. As a special bonus, if you sign up through me and spend $25 or more this weekend, you'll get a $2 bonus applied to your account after your points are credited to your account. It doesn't stop with shopping, either. You can earn points for everything from searching the web to watching videos and trying our new products and services. I don't have a lot of time to spend on Swagbucks each day, with all my blogs and websites to update - but I watch a few videos, do all my online searching and shopping thru Swagbucks - and earn $25-$150 in gift cards every month! Which of course I spend on more online shopping!